This month is decided to do an egg white spectacular! Egg whites are used to create some of the world’s most beautiful classic cocktails, but people often are turned off by the though of “eggs in my drink”. I’m here to tell you that egg whites are something you cannot taste in a well-made and balanced cocktail. They provide a silky texture or “mouth” for your cocktail and will provide an incredibly versatile frothy/foamy top. 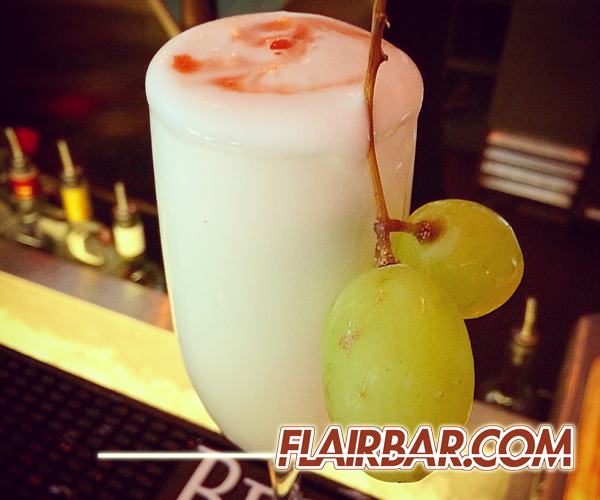 The first cocktail this month is a Chicago Ramos Fizz. Rum, beer, Port and Madeira wine are some of the original spirits of colonial America so it’s no surprise they blend well. Eggs and cream were often added to mixtures. The rum and port blend seamlessly in this cocktail and with some practice you can make this amazing foamy cocktail stand on top of your glass in a perfect column shape. This one is a sure crowd pleaser! Procedure: In a mixing tin shake 1-2 egg whites for 15 seconds. Crack and resell your shaker and shake for another 15 seconds vigorously. Add the Tanduay Rum, port, lemon juice and Finest Call Bar Syrup. Fill your mixing tin with ice and shake vigorously for at least one minute. Double strain the mixture into a Collins glass leaving about 3/4 of the glass empty. Gently add soda water to your glass which will cause your egg white foam to rise. When you get near the rim of the glass, allow the foam to set for 30 seconds. Slowly continue to add water until the foam rises above the glass. Garnish with lemon zest and serve immediately. Garnish: Lemon zest (use scissors or ravioli crimper) and a miniature clothespin. The Clover club is a simple and beautiful cocktail sure to convert any non-gin drinker almost instantly. Classic recipes call for a raspberry syrup and I don’t normally condone muddling in a high-volume situation, but fresh raspberries will make all the different in this cocktail and you need one for garnish anyways. Procedure: In a mixing tin shake 1-2 egg whites for 15 seconds. Crack and resell your shaker and shake for another 15 seconds vigorously. Re crack you shaker and add the raspberries. Muddle quickly and add your gin, lemon and Finest Call Bar Syrup. Fill your tin with ice and shake vigorously for at least one minute. Double strain into a chilled coupe glass and after foam sets drop the Peychaud’s bitters in a circle pattern and run a cocktail straw through them. Garnish: A gently placed raspberry. 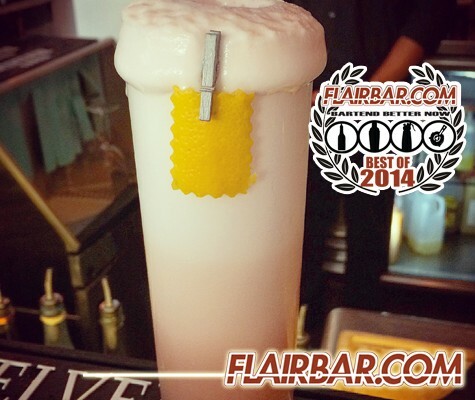 The pisco sour is an amazing classic cocktail that I hold near and dear. Being from a Chilean family, pisco was the first spirit I was ever exposed to. Pisco is a distillate of the Muscat grape which are abundant in Peru and Chile. 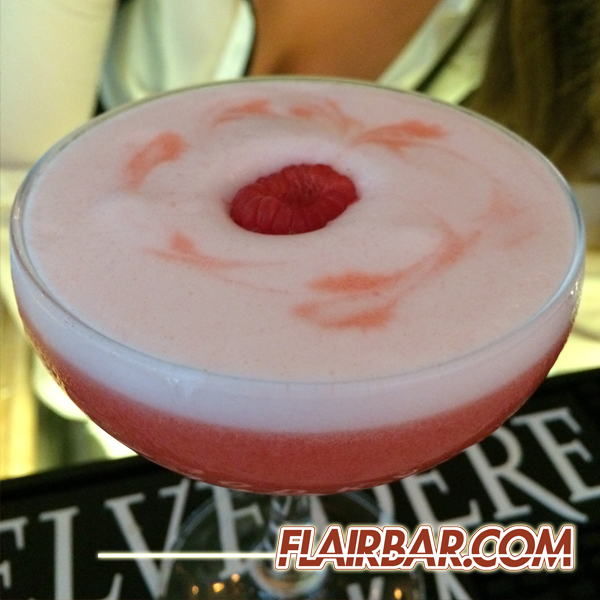 This cocktail is simple, beautiful and delicious! Procedure: In a mixing tin shake 1-2 egg whites for 15 seconds. Crack and resell your shaker and shake for another 15 seconds vigorously. Add your pisco, lemon and Finest Call Bar Syrup to the tin, fill with ice and shake vigorously for at least 1 minute. Double strain into a champagne flute and top with Angostura bitters. Garnish with a sprig of grapes.